The roadmap focuses the team on key initiatives and target behaviors, supporting effective allocation of time and resources. The outcome roadmap supports informed decision making. Insights are gained at-a-glance. Plans stay relevant and work can stop sooner on low important outcomes. The method minimizes implementation overhead. You deploy only as much of the method as needed to maintain confidence of success. We assume everyone knows how to execute. Look closely. You see uneven training, little consistency, wide variance in proficiency levels and no proven, repeatable process. S2E raises all participants to a best of class proficiency in a consistent, repeatable and fully transparent process. 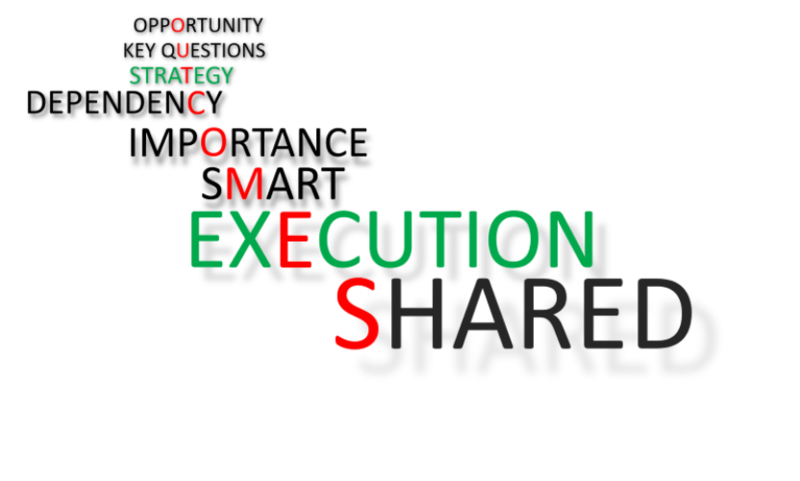 There is a high probability that conditions and expectations will change during the course of execution. “Fixed performance contracts” produce high failure rates against expectation, and well documented dysfunctional behavior. The senior commitment of a S2E team is to meet expectation – cost and timing are important but can’t override meeting expectation..
We create barriers to cross-functional optimization when we allocate resources by functional silo. Turf and territory battles consume throughput. With S2E, functional allocations are temporary resource pools from which resources are reallocated to cross-functional outcome owners. Knowledge is an important asset as capital, why would it be managed as a staff function? In S2E outcome owners are fully accountable for managing and developing their intellectual as well as capital assets. S2E is a discipline of continual reprioritization in an environment of full transparency. Resources continually shift to greatest opportunity based on changing conditions, expectations and performance. Spontaneously forming cross-functional teams are the way value gets created and transmitted across functions – often despite the formally constituted organization. S2E turns these underground and largely invisible engines of performance into officially recognized “enterprises”. Cross-functional “enterprises” are the most fertile ground for organizations to learn what they need to know next. S2E creates an environment where learning is rapidly registered across the “enterprise”. Managers at all levels are chronically over capacity. Either they can’t see it themselves or can’t get their superiors to prioritize activity. By capturing accountability for outcomes to multiple projects, S2E highlights overcapacity before it degrades throughput.